It was the simultaneous bombing of the American embassies in Dar es Salaam, Tanzania and Nairobi, Kenya that first brought the names of Osama bin Laden and al Qaeda to international attention. On an August morning suicide bombers parked lorries packed with explosives outside the embassy buildings and detonated them. The bombers began buying their supplies in May 1998 and Mohammed Odeh made both bombs, each weighing 907 kg (2,000 Ib). In Nairobi, around 212 people were killed, and an estimated 4,000 injured; in Dar es Salaam, the attack killed at least 11 and wounded 85. Most of the injured and dead were locals and only a dozen Americans died in the carnage in Kenya. The bombs exploded on the eighth anniversary of American troops entering Saudi Arabia in the first Gulf war. In retaliation for the attacks President Bill Clinton ordered cruise missile strikes on targets in Sudan and Afghanistan in Operation Infinite Reach on 20 August. Meanwhile, the FBI began to investigate, along with help from the Kenyan and Tanzanian authorities. Twenty-one people were eventually indicted for their role in the bombings. Some are held at Guantanamo Bay while others are at liberty. In May 2001 Mohamed al Owhali, a 24-year-old Saudi, Khalfan Khamis Mohamed, a 28-year-old from Tanzania, Mohamed Odeh, 36, from Jordan, and Wadih el Hage were convicted for their role in the bombings. They each got life without parole when they were sentenced on 18 October 2001. The sentencing marked the end of the only American prosecution to date involving members of al Qaeda. Another defendant, Ali Mohamed, pleaded guilty in 2000. 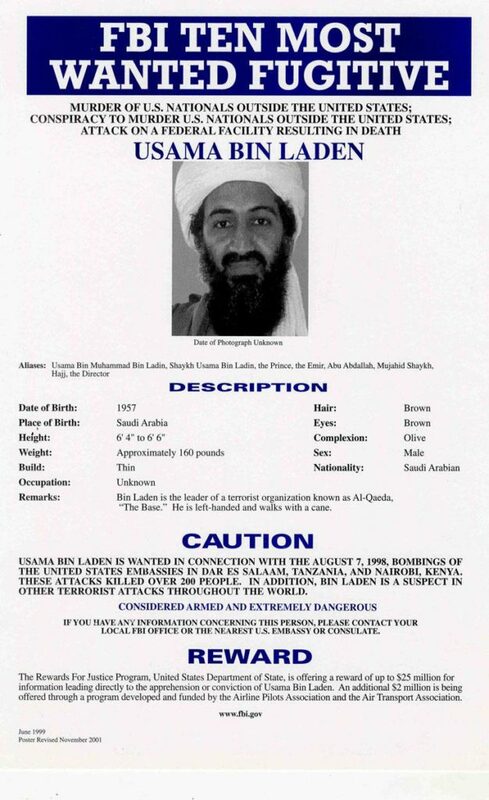 As a result of the bombings the FBI placed Osama bin Laden on its ‘Ten Most Wanted’ list.